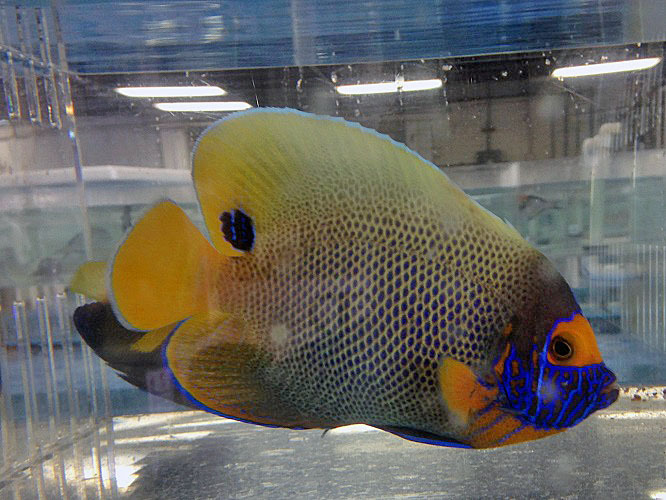 The Blueface Angelfish (Pomacanthus xanthometopon) changes color andf pattern as it matures from a juvenile into adulthood. The juvenile is colored with vertical stripes of blue, black and white. As it matures to about the 4-6″ range the pattern and colors change. The adult bluface is yellow and blue, with a yellow patch across the eyes and a blue face, and black spot toward the posterior top of the fish. The adult requires a 200+ gallon aquarium with several hiding places, and live rock to graze on. 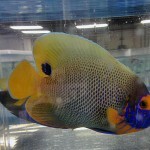 It is also recommended to keep as the only large angelfish, or added last as the blueface can become territorial and aggressive with its larger size.